Which Handgun Hanger do I need? 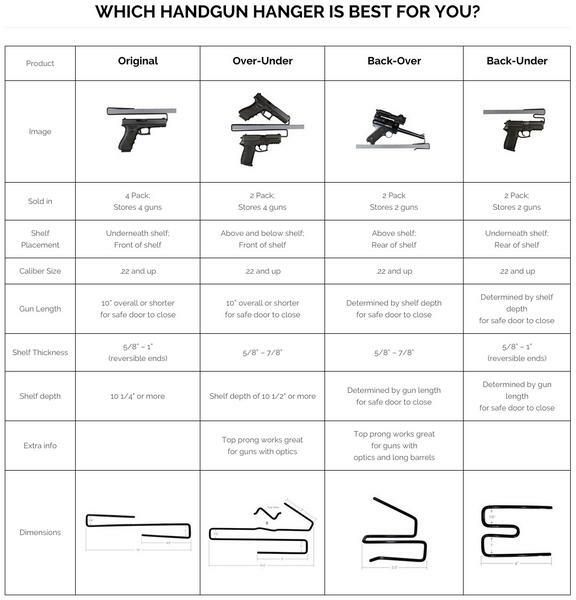 To help you decide which Handgun Hanger will work best for you view our Comparison Chart in the picture above. If you're still not sure, we offer a Variety Pack where you will receive one of each Handgun Hanger style. Very nice. Holds my handguns from .22-.357. Purchased 2 sets which holds 8 handguns securely and out of the way. There is a nice zig zag on the part that lays on the shelf so the holders are stable when empty. Put them on any shelf and set the spacing how you like it, not how a manufacturer thinks it should be set. Really saved a lot of space! Rubber coated to protect the barrel of the weapons. These fit great and really open up space on my safe shelves. It is almost like I have gotten a second safe.